Power outages are rapidly increasing in number across Southern New England as a powerful low pressure system and associated cold front push through the region. 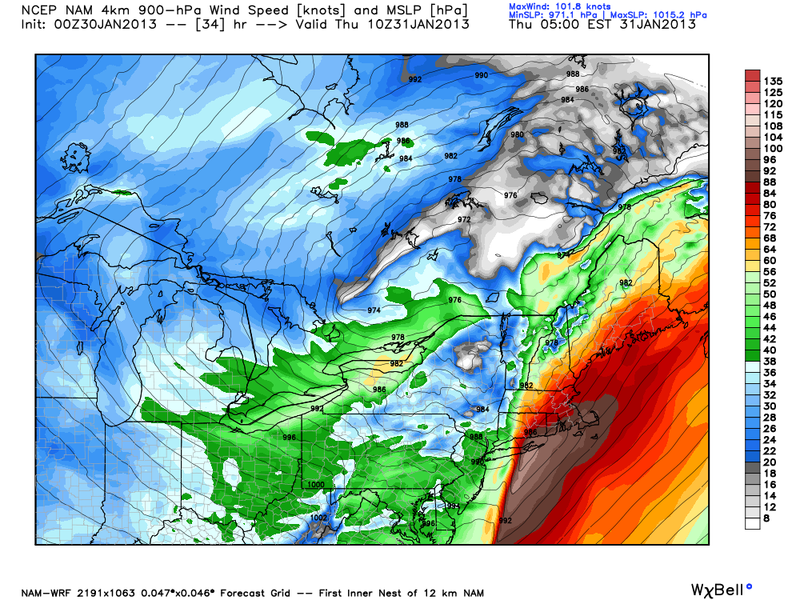 As of 610 AM the highest wind gust so far is 80 MPH atop Blue Hill Observatory in Milton. 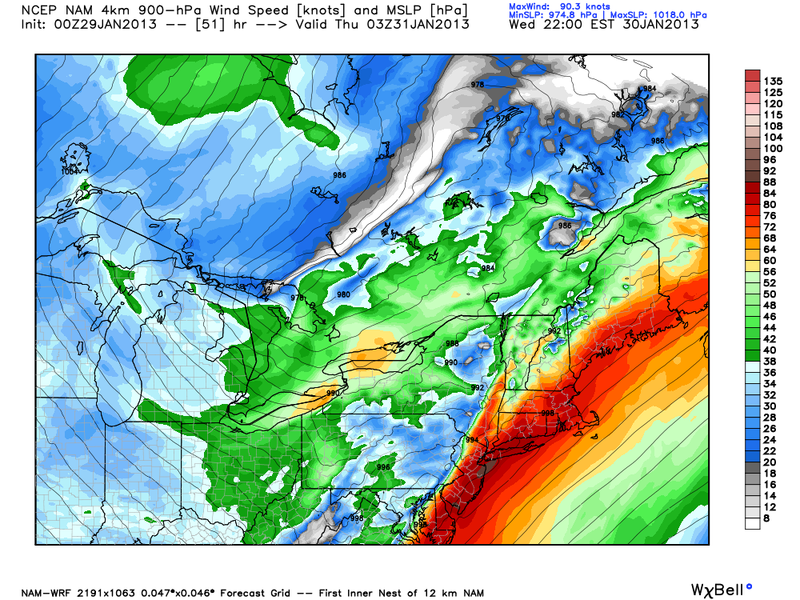 There was a 60 MPH gust in Boston. The winds will die down by 9 AM and rain should clear by 10. 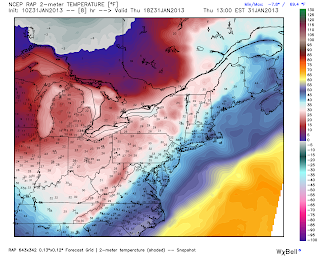 Temperatures will return to the upper 20's tomorrow. There are some snow chances for the weekend and next week. I have interest in a Sunday evening system and a Tuesday evening event. 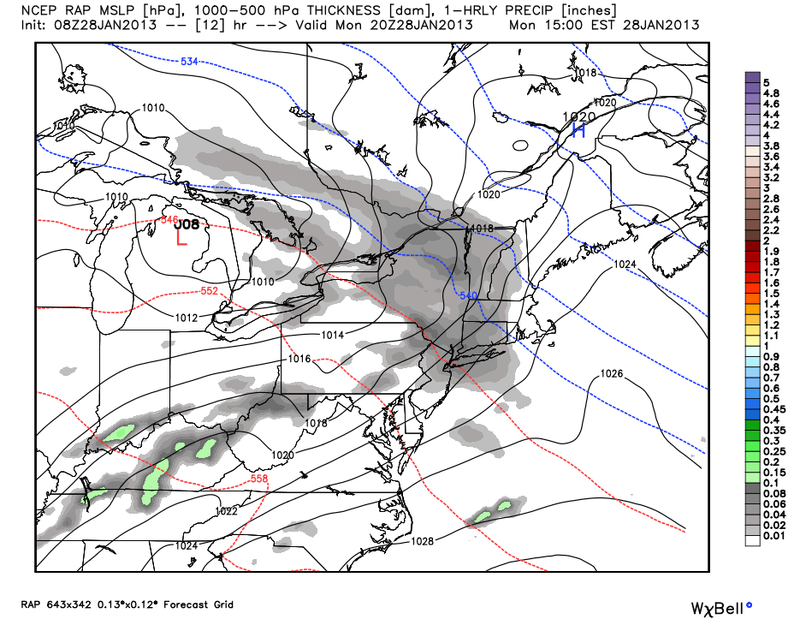 As of now I favor much of what we have seen so far in winter 2012-13; light snow from a storm that grazes SNE. Temperatures to Rise Above 32 Today! Temperatures today will be in the low 30's. The coldest spots in the region may not break 32 but I am expecting a high of 37 for Boston, 34 for Worcester, 36 for Providence, and 36 for Hartford. Winds will begin to increase overnight. As I wrote yesterday I expect some rain tomorrow. 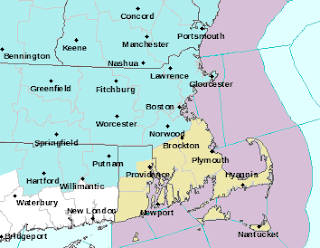 This is an interesting set up and it wouldn't surprise me to see Wind Advisories or High Wind Watches posted today. The big dip in the west is pushing east. There are ridges on both the east and west coast. 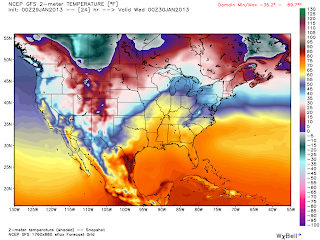 Temperatures tomorrow will soar into the 50's. Some light wintry precip will fall in the higher elevations tomorrow morning; the warmth is moving in aloft but the cold will hold on strong at the surface. 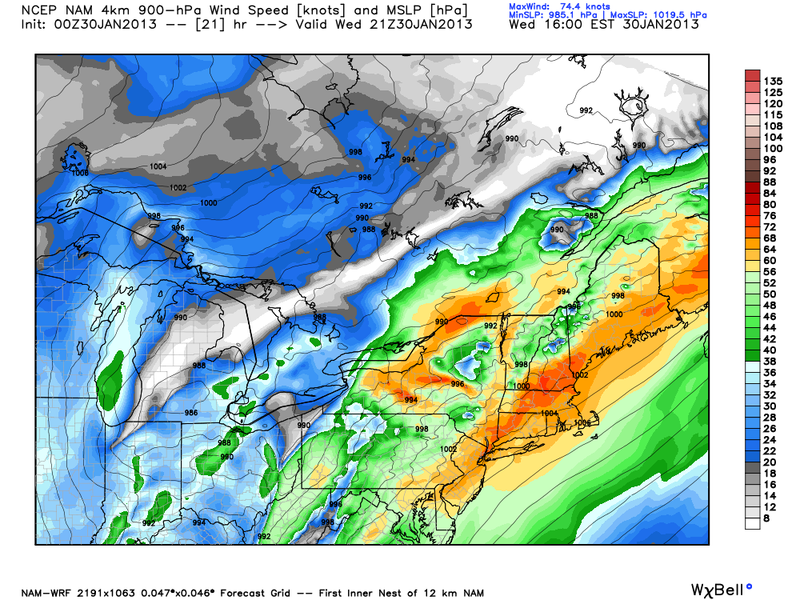 Eventually the cold front will have to push through overnight Wednesday with 1-2 inches of rain and strong winds. I'm not sure how much of this will mix to the surface. It depends on whether or not there is convection. 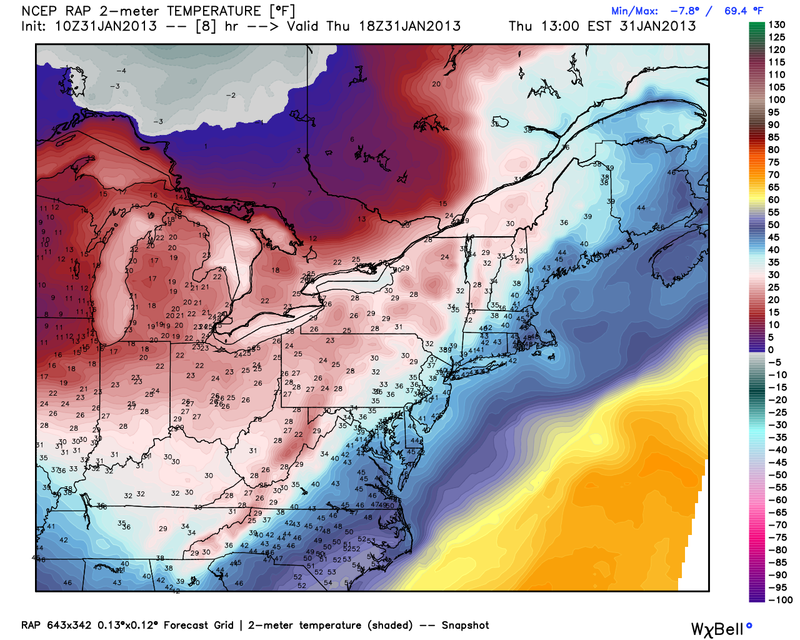 The cold air can inhibit mixing as well so we will also have to watch temperature trends. That's all for now, have a good day! 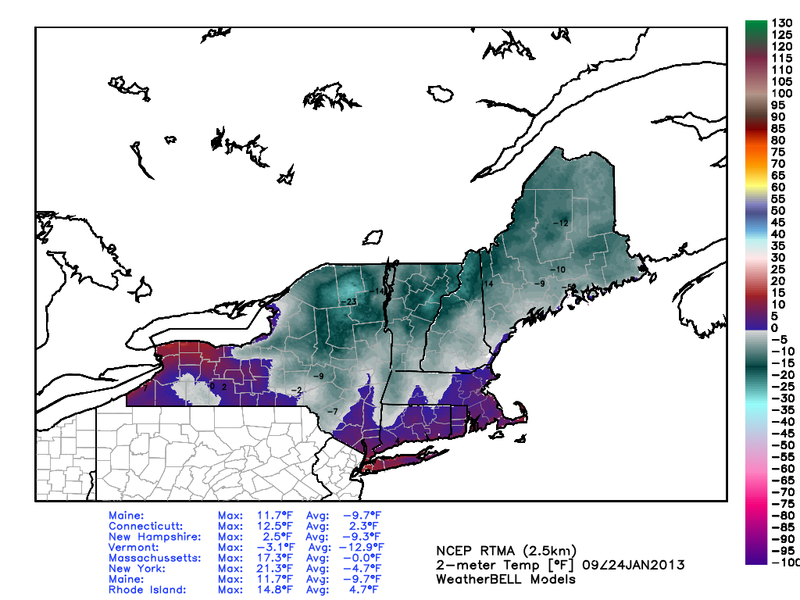 Generally I expect 1-3 inches South of Route 2 and 3-6 inches for Central and Northern New England. Some ice is possible although it appears to be more of a threat for the Mid Atlantic states. 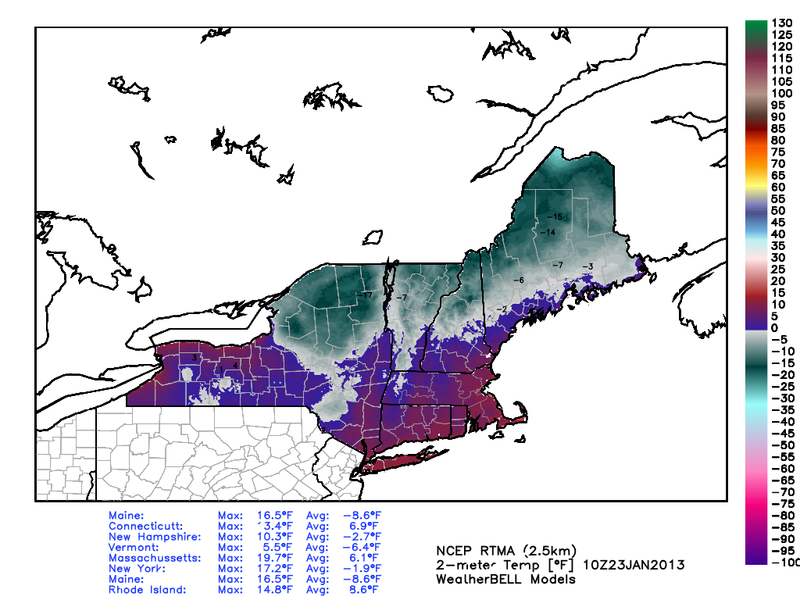 The majority of the snow ends before midnight although some will still be working off the Cape and Islands. The temperatures will continue to moderate today but before we can get into the upper 30's and 40's we will see a burst of light snow tomorrow night. 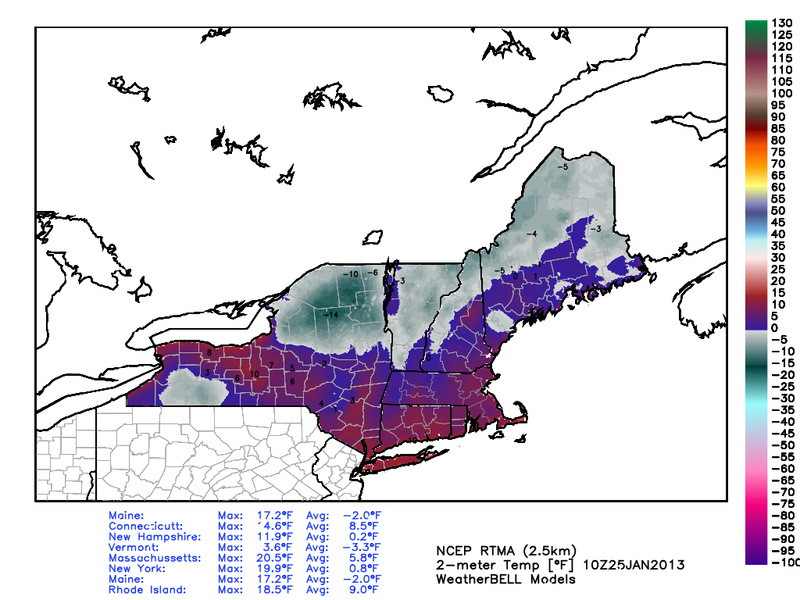 I expect light accumulation for most with the highest totals in New Hampshire and Maine. Temperatures today will be in the upper 20's and lows tonight will be in the upper teens. Its been 7 days for most people since we went above freezing and that streak will continue until tomorrow night. Northern New England stays cold but Southern New England is in the upper teens and low 20's. 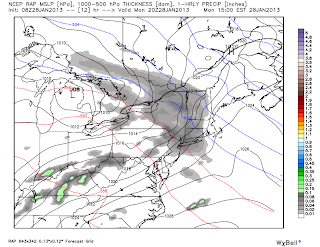 The snow should move in around 3 or 4 PM. A warm front lifting Northeast will be the cause of this storm. 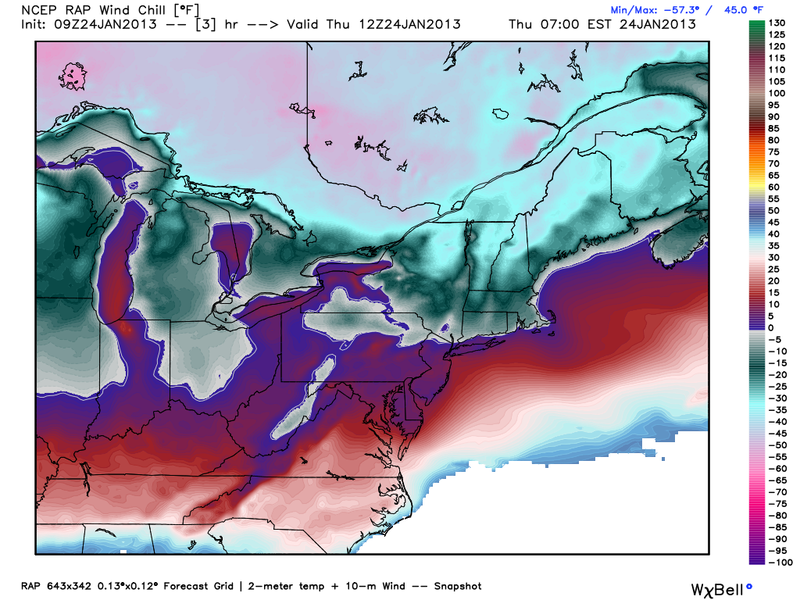 Arctic air is in place and the warm air will want to push over the top of the cold (more dense). This will create an icing situation after the initial snowfall. 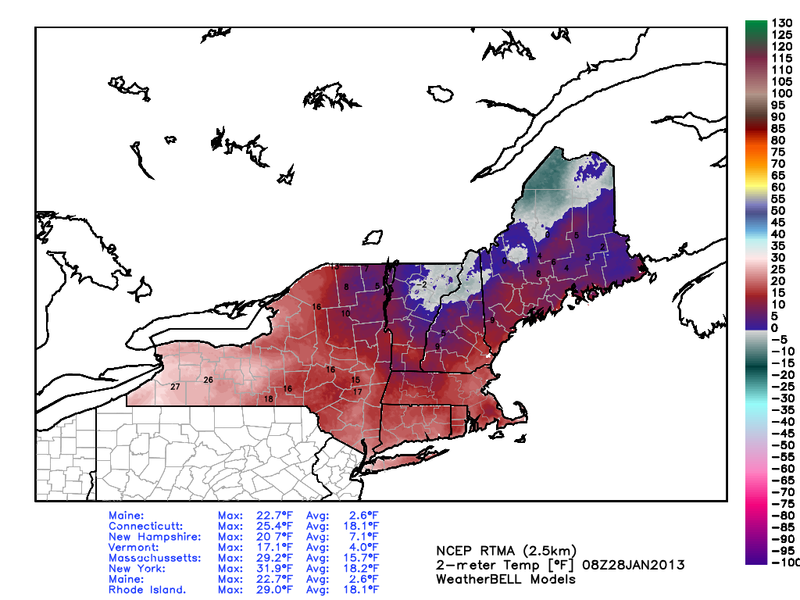 The further west one lives in New England the more likely they will be to see ice. 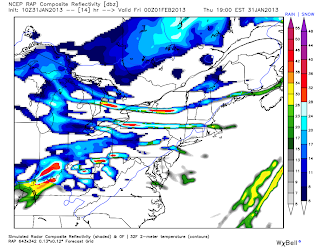 Notice that snow has the highest probability in the afternoon, while Ice is highest in the evening. 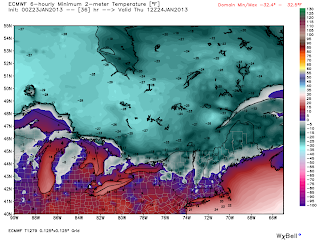 On Tuesday expect temperatures to rise to the upper 30's. Some place will crack the low 40's. On Wednesday another warm front will move into the Northeast and a burst ice is not out of the question. Temperatures will once again warm into the upper 40's (50 for some people) before a strong cold front drops a half inch of rain. That's all for now, have a good day. 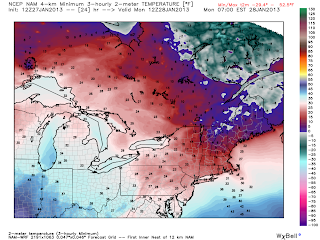 Cold Arctic air remains in place across Southern New England and that will do two things. 1) It will be cold and 2) It will push the majority of a snowstorm out to sea. I can't rule out a light dusting for some areas tonight and 1-3 on the Cape. Regardless we are starting off cold again, albeit a bit "warmer" than yesterday. A windchill advisory is in effect until 10 AM for much of Massachusetts and parts of RI and CT. Here is the surface chart for this morning. I've circled a pair of low pressure systems which is combine energy in the Ohio Valley and then reform a new center on the Coastal Plain. I've drawn the wind direction around the high pressure in the Northeast, helping to suppress any waves from jumping up the coast. 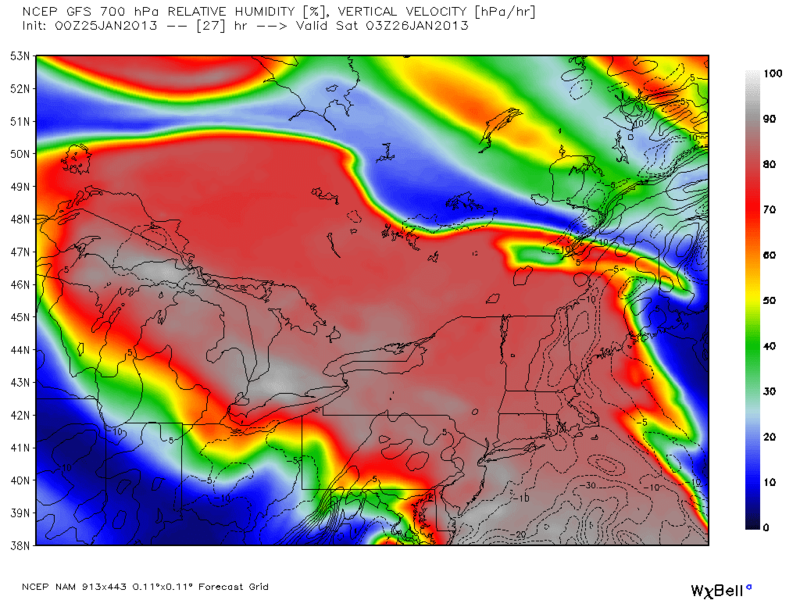 At 850 mb however the ideal snow growth zone is too far to the south. I won't make a map but I expect a dusting to 2 inches South of the Pike. Saturday will be cold like the past few days. 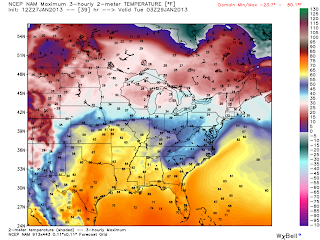 Temperatures will begin to moderate during the overnights and during the day. By that I mean expect highs in the mid 20's and lows in the upper single digits to low teens. 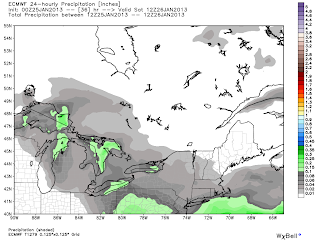 Temps will try to rise on Monday and there looks to be some precip. Right now I think an icing event is likely. 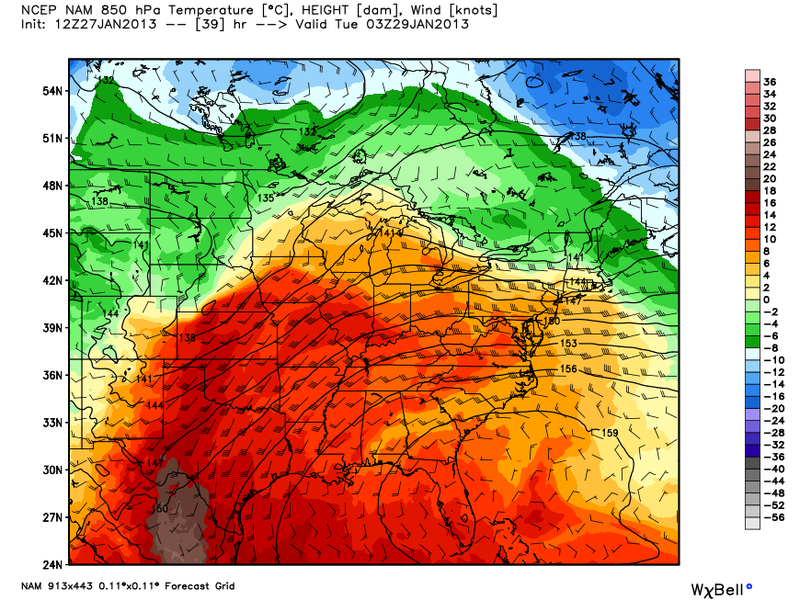 A ridge isn't going to just push this cold dense Arctic air out, not without a fight. 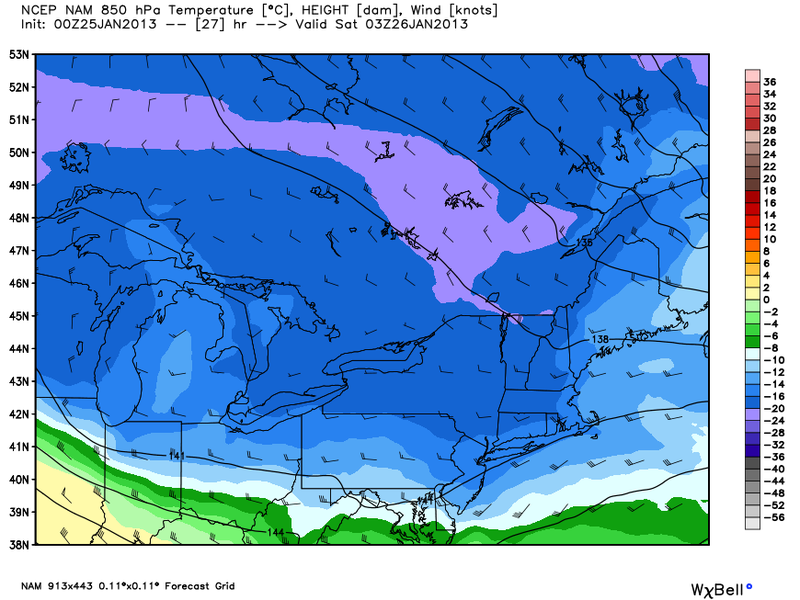 Cold will linger in the lower levels. 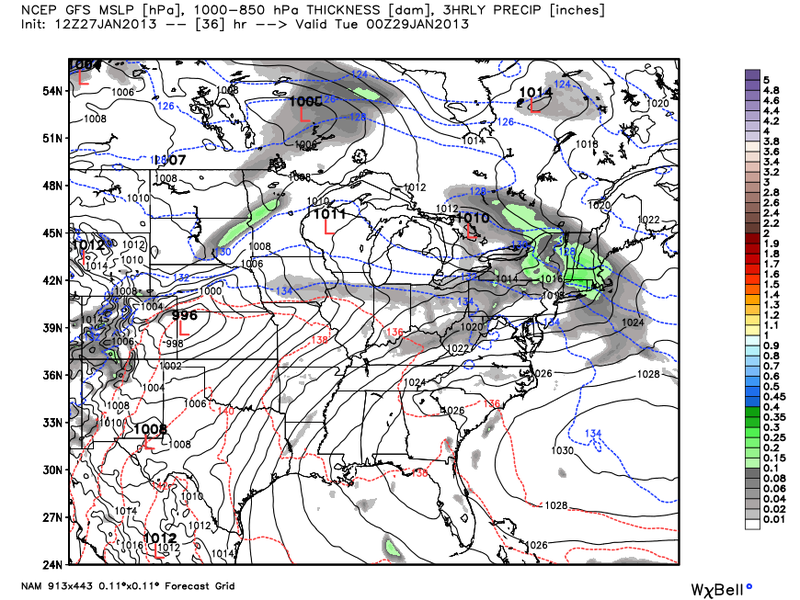 Also notice the high pressure stuck up in Canada. Looks like ice and I hope I am wrong. There is nothing worse than ice. Have a good day. 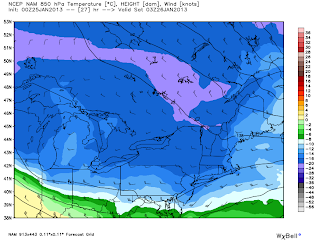 Air temperatures should slowly moderate into the lower to mid teens. 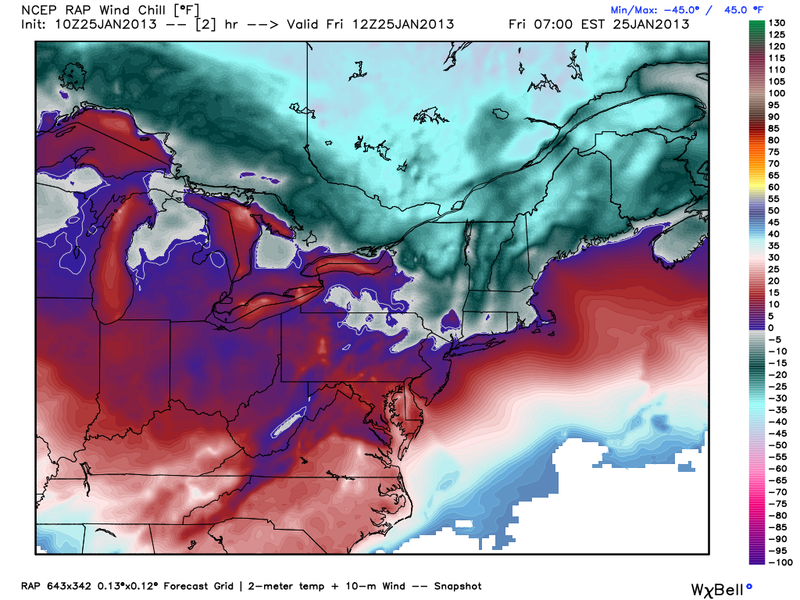 Wind chills will briefly climb above zero this afternoon before increasing again when the sun goes down. 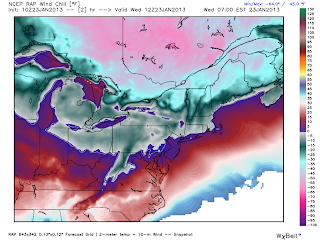 Tonight we again drop down close to zero with windchills again approaching -20 F. Try not to stay outside in this too long today it will be nasty. 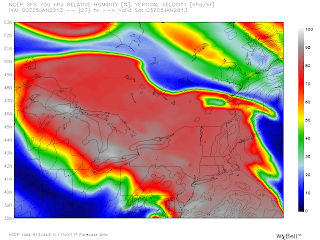 These two figures will update today but what the RMOP shows is uncertainty in the depth of the trough in the year and uncertainty in the ridge in the west. 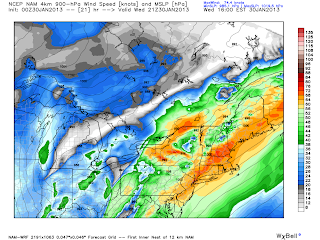 It will be important to watch for jet streaks at 300 mb today to see if the ridge really wants to pump in the west or amplify the trough in the east. 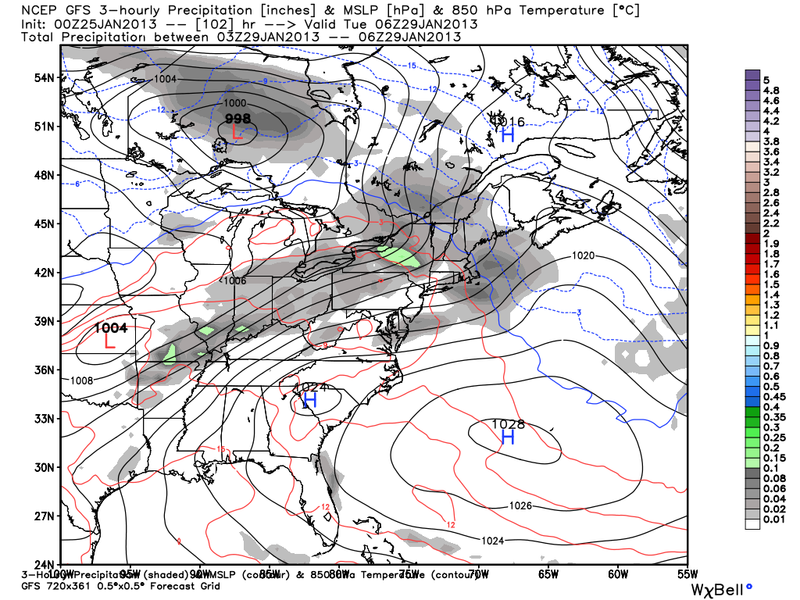 As it stands the latest Short range ensembles are not big on precip but have good RH at 700 mb. 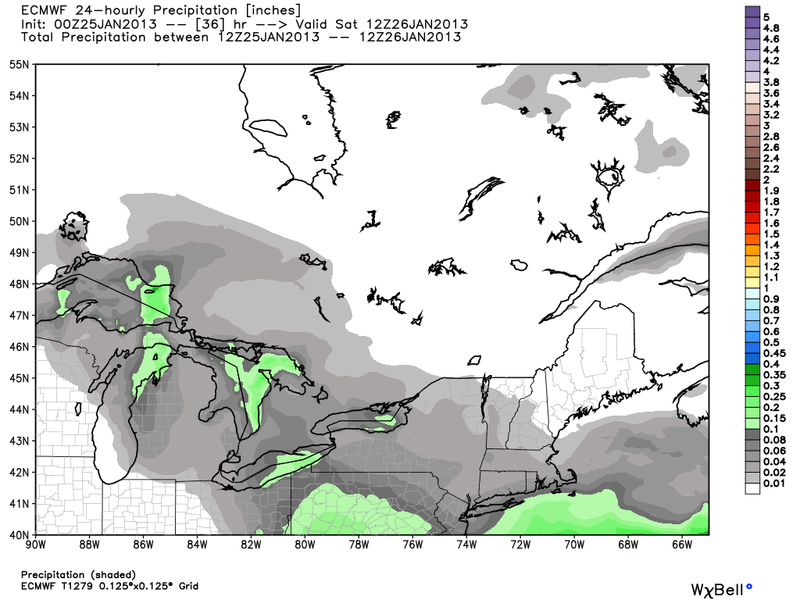 This should help the concerns over the air mass being too dry for snow. What is causing the Arctic Air? 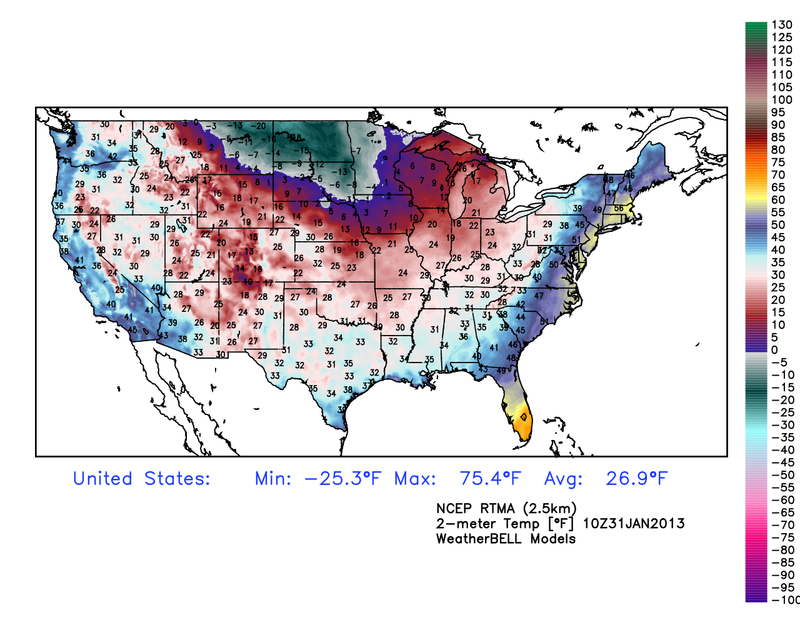 In simple terms cold high pressure from Canada is sending true Arctic air into the Northeast and Great Lakes. 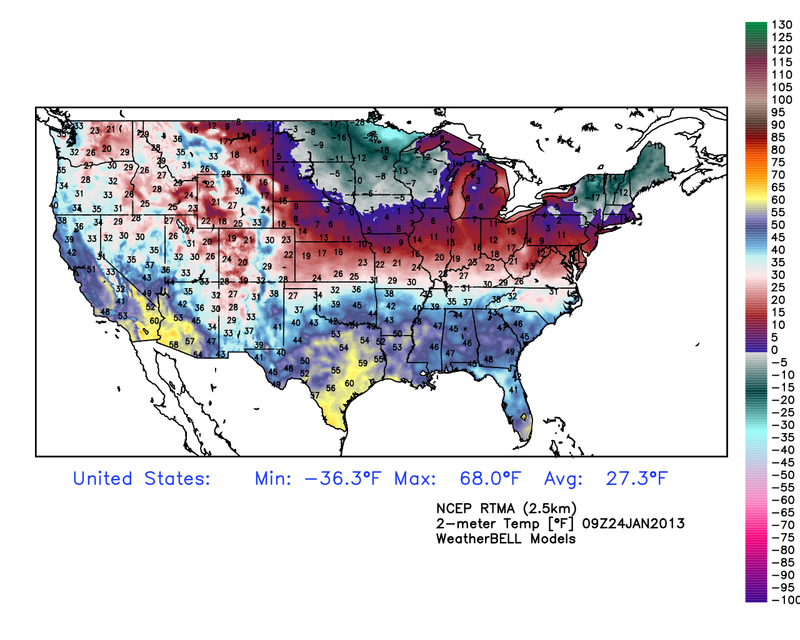 This will continue in fact tonight and tomorrow morning will be downright cold. 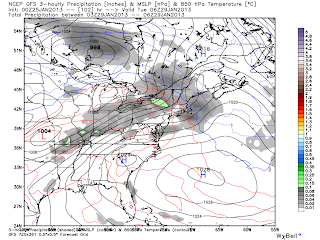 Still watching the potential for snow overnight Friday into Saturday. It doesn't appear to the computer guidance to be a big deal at all. 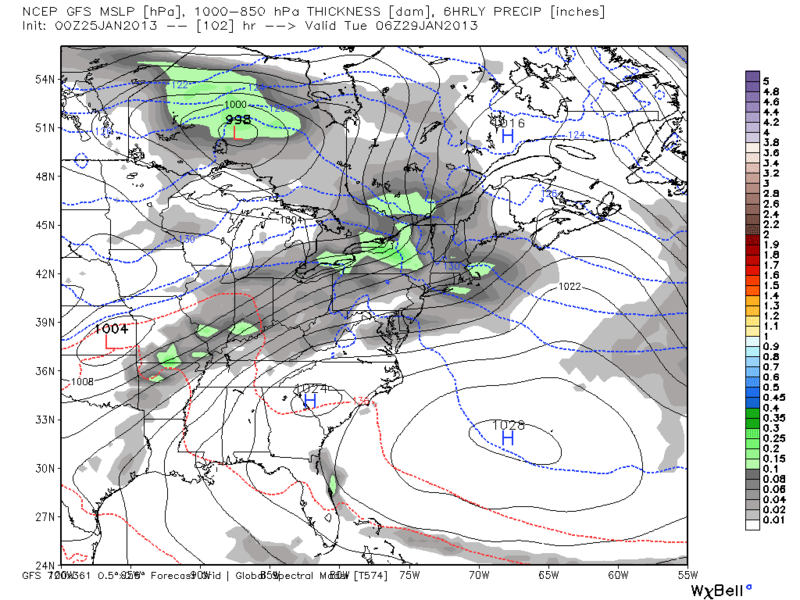 However there are several things that make me question the model solution a bit; we have time to watch the system. Here is the HPC 1 inch snowfall probability for Friday 7 AM- Saturday 7 AM. We could pick up another few inches on Saturday. Also keep in mind it will be a fluffy snow that piles up quick. 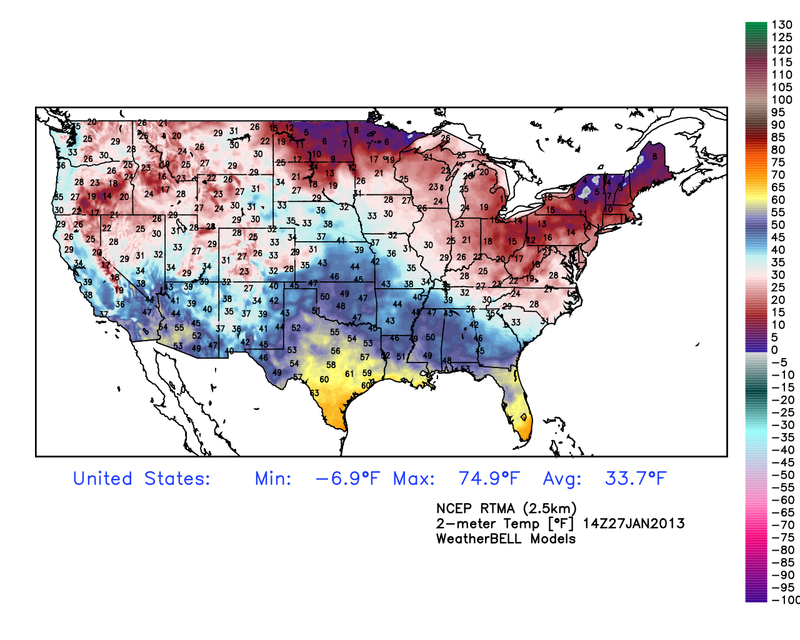 If today's trends hold I'll have to admit the Arctic air wins and this system will move out to sea. More later, have a good day! Cold Again Tonight, January Thaw Next Week?